The village La Restinga south of El Hierro at the Mar de Las Calmas is a magnet to scuba diving enthusiasts. El Hierro is the smallest, remotest, most westerly situated island of the Canary Islands. The north is a rugged place with steep cliffs preventing the formation of excellent beaches. There are some nice coves and volcanic crater pools near the villages of La Caleta and Tamaduste. South you will find the pine forests of El Pinar and the village of La Restinga, where most tourists reside especially scuba diving fanatics. La Restinga is surrounded by hills with bizarre lava formations and also has the honor to be the driest part of the island. The fertile land of El Golfo with its vineyards, pineapple and banana plantages is found in the west near Tigaday, El Sabinar and la Frontera. Hikers will love this island as it is the place where one of the most famous religious walks is located. During fiesta Bajada de la Virgen de Los Reyes (once every four years) many pilgrims walk the 26km from the chapel in the west across the island. They bring a statue of the virgin seated in a chair to the capital Valverde. Other memorably walks are the Canimo de Jimana with excellent views of El Golfo and the Atlantic Ocean. Don't miss Roque de la Bonanza, Roques de Salmor, Mirador de la Pina and the top of Malpaso (1501m high), El Hierro's highest point. Besides hiking, diving and relaxing you can visit Punta de Orchilla which was used as the navigational zero meridian up until 1883 when it was replaced by Greenwich. El Hierro or La Isla Chiquita is the less developed and most remote destination in the Canaries which has done well to its marine life. The Calm Sea or Mar de Las Calmas (protected by UNESCO since 2000) in the south offers steep wall dives in quiet waters that are great conditions for coral growth and excellent habitats for pelagic species. Reefs, pinnacles, boulders, caves and volcanic arches are some of the key characteristics often found while diving here. You need advanced diving certification as many dives are deep and can have strong currents. 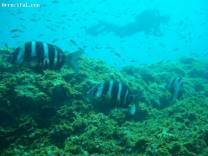 You will find many small fish feeding off the coral while schools of larger predators hunt along the walls. Tropical species such as spiny globefish, trumpet fish, puffer fish, seabream, tuna, grey triggerfish and yellow groupers are common. Even manta rays, hammerhead sharks and whalesharks are sometimes seen here. Many diving photo competitions are held here and it is one of the best diving destinations worldwide. We offer high quality diving instruction and daily boat departures to some of the most beautiful dive sites in Europe. We specialise in tailored packages for individuals and groups that include: diving, accommodation and car rental. From our Dive Centre in La Restinga, located on the southern tip of El Hierro, we dive more than 20 dive sites less than 15 minutes by boat. The Mar de las Calmas Marine Reserve is protected from the prevailing winds and is perfect for year round diving with visibility as much as 40m at times and rarely less than 20m. The area also gets the least rain and most sun in El Hierro. The underwater landscape was formed by volcanic activity and very close to shore the bottom drops to more than 300m. The seabed is covered in rocky formations such as pinnacles, big drop off's, caves and tunnels. The dense vegetation on the rocks gives rise to a large diversity of life. On the bottom and hidden in the many cracks and crevasses you will find Lobsters, Shrimp, Seahorses, Black and Yellow Corals, Anemones and Sponges. Swimming in the crystal clear waters you will see Tuna, Parrotfish, Groupers, Flatfish, Perches, Angel Sharks, Octopus, Sting Rays and many species of Moray Eels. Seasonal visitors to the area include Sand Tiger Sharks, Manta Rays, Whale Sharks, Dolphins and Turtles.